I spend a few minutes each day chatting with myself, do you? My conversations range from things I should have said to questions I would be asked if I were on a radio station. All quite silly things to be truthful. With these said conversations I solve many world problems, issues with family and convince myself that I pretty much have all of the answers. If only someone would ask. Of course I am joking, I don't have all the answers but sometimes it's fun to pretend that we do. On this day, a week ago, I was playing the what if game. What if I were on a radio show and someone asked me, "who would you say was your greatest influence in the kitchen?" I was so quick and on my feet for this pretend interview that I immediately said, "why, my grandmother of course". This is when the conversation became really fun and active in my head. I actually had to disagree with myself and somehow I was okay with that. I stopped the interview, and proceeded to have a quick moment of reflection. This is what I learned about my influences for my passion of cooking and preparing food. 1. My grandmother did influence me in the kitchen on many levels, but she was not the ONE influence. The thing I learned and remember most often, is that when you are making a recipe always put everything away as you use it. Then when your cookies are made, there is not a huge mess to clean up (hubby please take note). I realized that my grandmother made the same things for dinners. She rarely altered the food fare on the table. Her influence for me was the desire to be in the kitchen and work with my hands. She made fabulous desserts. 2. My mother worked and owned a restaurant. I was influenced by being in the kitchens and smelling the food that was being prepared. My Mom worked really hard so that her three girls could have the things they needed and wanted. She taught me to work hard and this has influenced my passion for cooking and writing. Along the way my Mom has continued to try and learn new recipes, I love this desire to evolve and create. She has continued to learn new things. 3. I love to travel. When we have traveled in the past we visit the museums, the parks, the rides, the tours and the tourist spots of most places we visit. I have decided that most cities and towns have pretty much the same functions with a few unique places to visit. The key is finding what makes each of those places unique and different. I find that this is fondly found in the foods that are served around town. Food tells a story of the region or location just as much as the people or museums do. Traveling has had a huge influence on the way that I cook and find inspiration. I often return home from a trip and try to find recipes or develop recipes that remind me of where I had just been. 4. My family, health and desire to eat right probably have the greatest influence over how I cook and what I make. Without my kids I would not have a reason to make big meals, prepare for birthdays, save recipes, share or teach with them my love for making bread and this list could go on an on. Getting back to the question, "who would you say was your greatest influence in the kitchen?" I would have to say my family, my love for traveling and my willingness to never stop learning. It's these influences that influenced this dish. I did not develop this dish, it has been around for years. I just had the ingredients on hand, new that my family would love it, saw it on several other blogs, immediately thought of my time spent in France and it was my ever increasing desire to do something new and different that influenced this dish to be made last week. As my life changes I am sure my influences will too. I look forward to the adventure ahead. 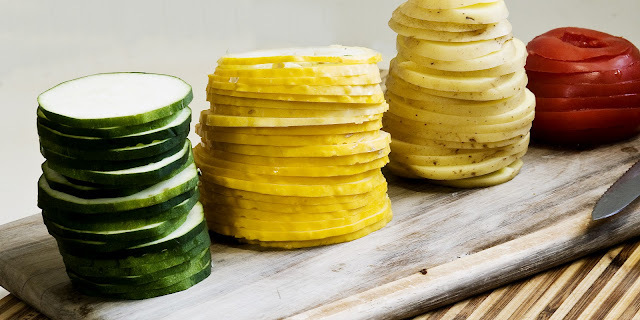 This is a simple way to use your veggies from the garden to create a dish with a gourmet flair and appearance. Using sprigs of fresh herbs adds that special little touch to make your family and friends ooh and ah. 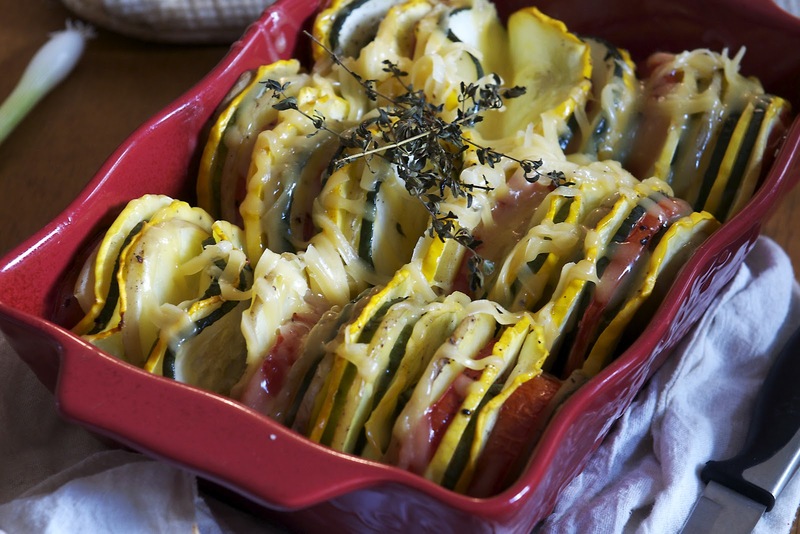 8-3-2012 This recipe was shared on Amee's Savory Dish: Fit and Fabulous Friday. Go check out the other amazing and healthy recipes. 1/2 cup of cheese, I used Edam. Cheddar, Jack, Parmesan all can be used too. Why are there not any ingredient amounts? Simply because this dish can be made in a 9X13 or as an individual serving. You decide how big or how much you want to make and that will determine what you will need to have on hand. For me, I did one of each (except for the tomato, I had two). This was prepared in a 7X10 tian (shallow ceramic baking dish). Cut your veggies. I used a mandolin and this is how I was able to achieve the consistency in width for each veggie. Saute your chopped onion and minced garlic in olive oil. 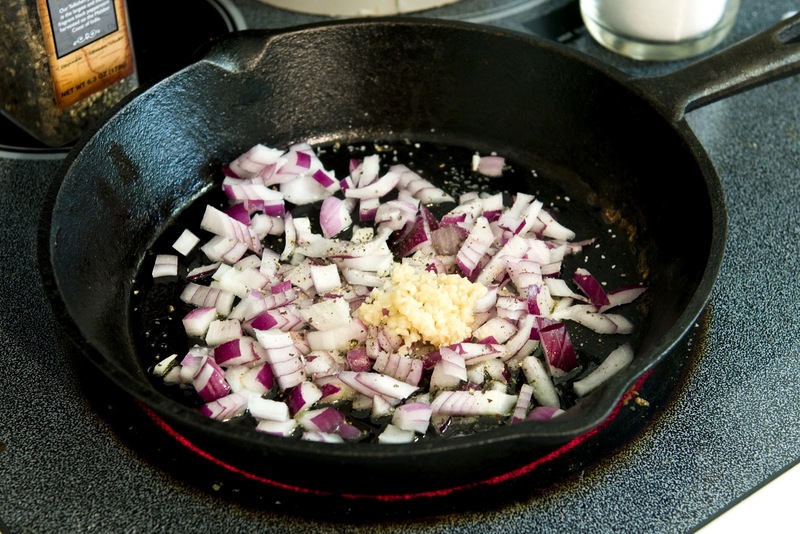 In the bottom of your baking dish, spread the onion/garlic mixture. 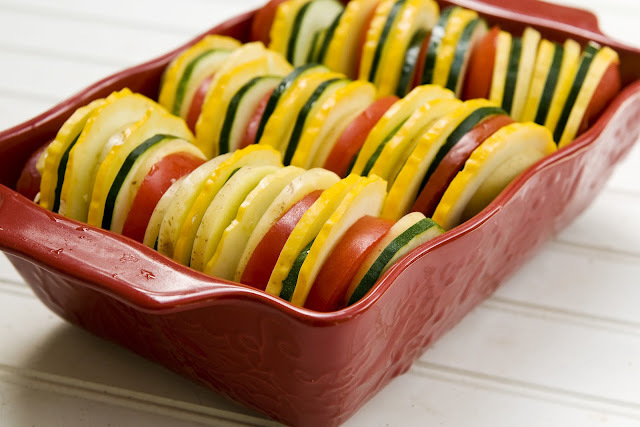 Start stacking your veggies and then laying them in rows in your dish. You can pack them tight if you want, they do reduce and shrink a bit when cooked. Season with salt, pepper and olive oil. I added 4 sprigs of thyme. Cover with foil and bake until done. Mine took 40 minutes to cook. It was all based on the potatoes (they took the longest to cook). When they were done, I removed the foil and added some cheese. 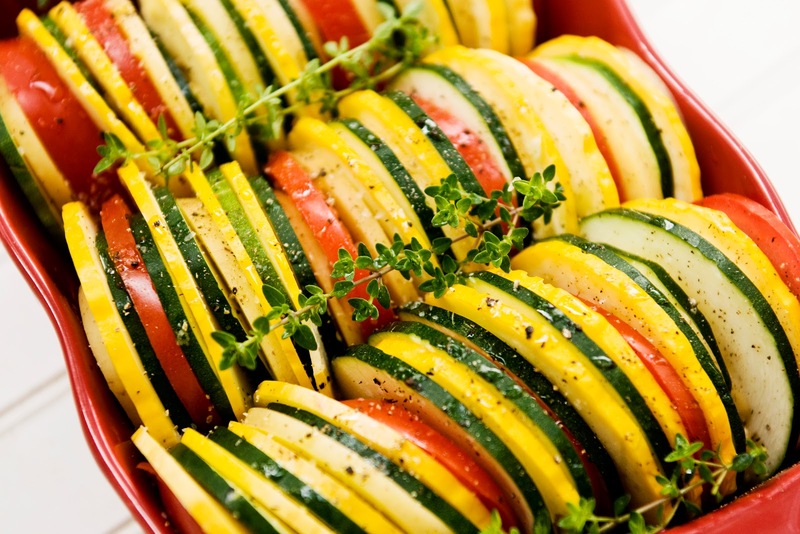 this is wonderful, I love lot of veggies! Oh..what a colorful dish and tempting too..
What a colourful and delicious dish. A true thing of beauty. And what a nice presentation! I look forward to try this soon!